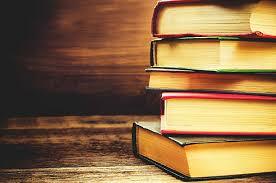 Have you ever read a book that instantly reminded you of your life? I felt this way with Little Moments of Love by Catana Chetwynd. I have been following Catana Comics online since they started in 2016. When I noticed that Catana was coming out with a collected book of comics, I knew I needed to read it. 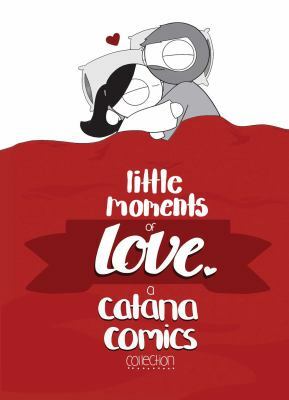 Little Moments of Love by Catana Chetwynd is all about Catana and her boyfriend John. The title of this book couldn’t be more true. As I was reading this, I was hit with all the love pouring from each comic. These moments of everyday relationships will force you to slow down and look at your life a little bit differently. It’s the tiny acts of love scattered throughout the day that have the biggest impact on the ones around you. It doesn’t take much to brighten someone’s day and these comics certainly illustrate that. Catana’s round drawings and repeated expressions of love gave me an all-over good feeling as I flipped through this book. I found myself repeatedly thinking, ‘Oh that’s me!’ or ‘I do that all the time’! The seemingly instant relatability of this comic has quickly made it one of my favorites to read and one that I’m always on the look out for when I’m looking online. These collections of relatable everyday humor show readers that it’s the little moments of life that end up meaning the most. Give this graphic novel a read and see if you can find yourself or your significant other in any of these comics. It’s a good read. 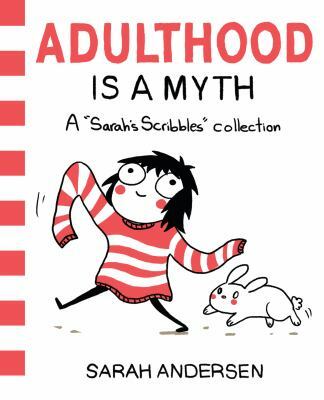 Sarah Anderson has long been one of my favorite webcomic artists to follow, so when I found out she was putting out a graphic novel called Adulthood is a Myth: A “Sarah’s Scribbles” Collection, I knew this would be something I needed to read. You may not be 100% familiar with Sarah’s Scribbles, but I bet you have probably been shown some of her comics online, whether it be through Facebook, Twitter, a Buzzfeed post, or even on the news. Her black-and-white sketches have become a sort of rallying cry for young adults, as Andersen is able to take everyday situations that can conjure up anxiety, awkwardness, and dread in current adult life and add a completely honest, yet funny, take on them. Sarah’s Scribbles covers everything from body hair, talking to guys, being a giant introvert, how your body looks, relationships, being self-conscious, and SO MUCH MORE. I constantly found comics that I related to all throughout this book and also on her website where she posts current comics every few days. She has this way of drawing and communicating her comics that immediately make them incredibly relatable, endearing, and immensely hilarious all at the same time. Andersen covers current topics in her comics, while also being sure to cover scenes of everyday life that we all know too well: the frustration of the wifi going down even when it’s a perfectly nice day out and we could go outside or even read a book TO the sheer bliss of being able to tell your past self that things will get better TO the immense stress we all sometimes feel and yet keep covered from everyone in our lives. This graphic novel is relatable for people of all ages and I encourage you to read it for yourself. Step Aside, Pops: A Hark! 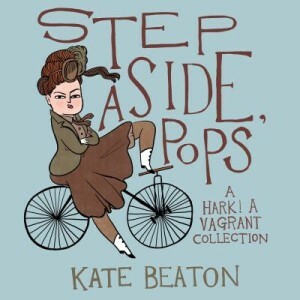 A Vagrant Collection is Kate Beaton’s third published book of comics, but fourth overall. (Other ones by Beaton that the library owns are Hark! A Vagrant and The Princess and the Pony.) This new graphic novel is a collection of strips from her webcomic, Hark! A Vagrant. Webcomics are generally self-published online and are sometimes even published into books or as single strips in magazines or newspapers depending upon their popularity. In Step Aside, Pops, Beaton takes a turn at digging into the lives of various literary, historical, and contemporary figures and characters. Think of this graphic novel as a collection of Beaton’s musings and ideas about different people throughout history. Her obvious love of all things literature, historical, and pop culture related flow through this graphic novel as she dissects the lives of Wonder Woman, what it was really like to be a peasant in a time of no medicine or deodorant, and how different famous Alexanders handled rough situations throughout time. Crack open this graphic novel and you’ll see how Beaton reimagines the lives of Achilles, the founding fathers when they find themselves in a shopping mall, and even how Cinderella would have played out if she had been a bodybuilder. Webcomics collected for the printed page rarely hang together as cohesive singular works, and this book is no exception. They also rarely deliver a consistent laughs-per-page number or manage to be as fresh on page 50 as they are on page 1; and for these, Hark! A Vagrant is indeed an exception. 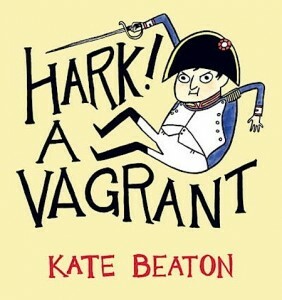 Kate Beaton’s comic is very funny and accessible; she pokes fun at various literary and historical figures (both infamous and obscure), in addition to hipsters and teenagers and even superheroes. If you like smarmy, witty, smart comedy and drawings that range from the moody and surreal to the supremely cute, this book is a great choice! 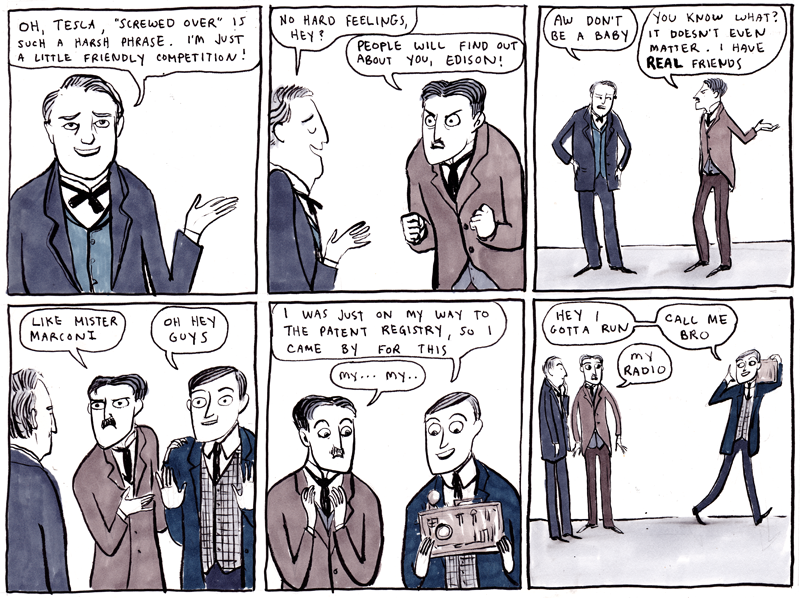 For more awesome, check out Kate Beaton’s comics at their original home: harkavagrant.com.